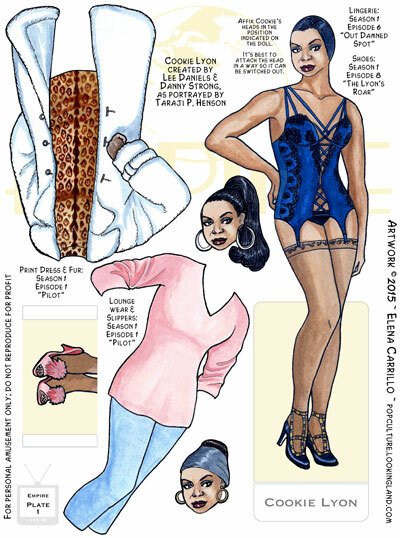 Looking back on Cookie’s wardrobe, I’m surprised so many things went right with this paper doll, considering how many things could have gone wrong. For one thing. I was out of my depth. 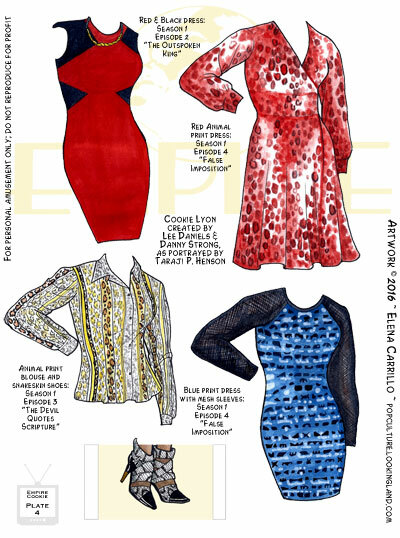 Up until this point I had never drawn any contemporary fashion paper dolls that were stylish in any way. And Cookie is very stylish. So a lot of what I was doing with these pieces was pure trial and error and fixing mistakes as I went along. You can see by the copyright on these plates that I actually did them in the fall/winter of 2015, so my memory is slightly hazy, but I do recollect that I struggled. Most critically: use the right tools for the right job. My biggest mistake with these plates was one I should have learned long ago: you can’t paint intensively on cardstock! 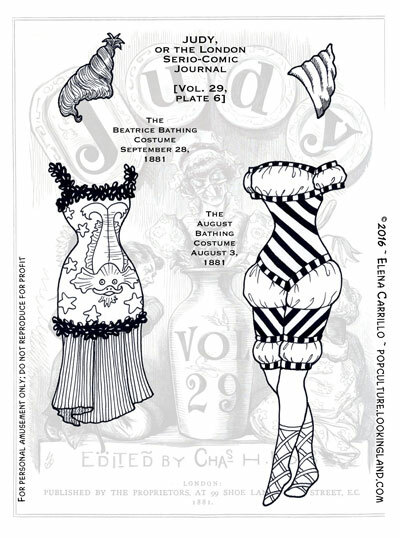 A million years ago when I painted my 19th century paper dolls, I exhausted myself fighting with the cardstock. So I’m not sure why I repeated the mistake. I guess I was being thrifty? Looking back it doesn’t even make sense. I have piles of watercolor paper that was paid for 20 years ago. The real waste is in not actually using it for, you know, painting! Using the cardstock is great for Judy or other black and white or marker dolls. All the Star Wars dolls are on cardstock. But this is why I’m putting the runway dolls on real hot press cotton watercolor paper. I don’t want to fight with the materials any more! Seems a bit strange posting bathing costumes in December, but I guess that’s the way this one fell out. These were actually featured in August and September issues of Vol. 29 (September still feels kind of late for swimwear, but there you have it!). These are pretty simple pieces. Love the hair twist for the first costume. Also feel compelled to explain that the decoration on that outfit is supposed to be cockle shells (my rendering wasn’t so good). I decided (sound the trumpets) that we will be getting new Judy dolls in the new year. I have 9 more volumes of costumes and 6 others I could probably get through interlibrary loan if I got ambitious. So there’s still plenty of material to work. And I’m finally going to hit the issues where Chasemore’s drawings really explode creatively! So I think this is a great time to do this shift. Judy will return in January with the Catwalk dolls. I haven’t yet decided whether I will be picking up a third series or idly adding anything else at this point. But I can be predictably over-ambitious, so expect to see the Star Wars: Force Awakens dolls at the very least. Meanwhile, to find all the plates in this series (and the dolls themselves) click on the Judy tag down below. 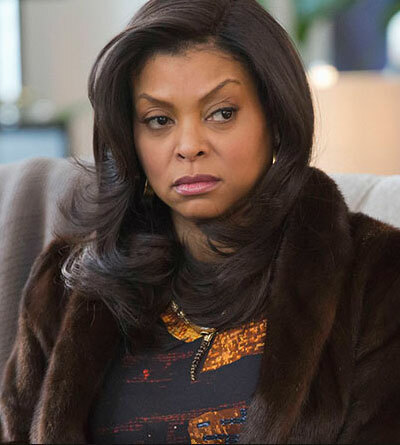 The beautiful Taraji P. Henson plays Cookie Lyon on Empire. Cookie is the long-suffering ex-wife of Lyon Dynasty king Lucious. She served 17 years in prison so that Lucious could build his music empire, and he repaid her by divorcing her while she was incarcerated. But the two have deep ties (including three sons), and their relationship, while volatile, is far from over. Cookie wastes no time, once she’s released from prison, enjoying the spoils of her husband’s success. 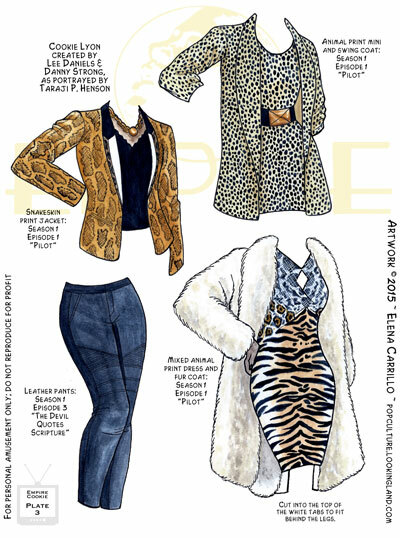 She’s quite the fashion plate and her animal prints and furs are legion. Once in a while she wears something down to earth like the lounge wear on this plate, but by and large she’s always on display. Here she wears a bit of infamous lingerie (I meant to include the fur that goes with it in a subsequent plate–maybe I still will). Her Valentino shoes actually don’t go with either of these outfits, but I like them and wanted to give her a pair of shoes that could match with most of her outfits (because I can’t always clearly see her footwear in the show). The two outfits and hairstyles are from the pilot episode. As I mentioned long ago, I had intended to work through Cookie’s Season One outfits, then catch up to Season Two before the mid-season break was over last March. Now we’re at the end of Season Three and it feels doubtful I will ever catch up. Cookie is quite the clothes-horse. I hadn’t intended to do all her outfits, but I wanted to hit the highlights. She has a lot of highlights. Cookie is a great TV character: she’s perfectly vindictive and yet she’s all heart. She loves her children and she’s been deeply wronged by her ex-husband and circumstances in the world. So even though she occasionally does some pretty heinous things, you can’t help but root for her. Henson’s performance is wonderfully sympathetic. There’s just an amazing clash of over-the-top garish loud-mouth brassiness and spangles cut by an undercurrent of past suffering and abiding love in her. She’s also street-smart and conniving–you know she’s capable of just about anything, which makes her dangerous. 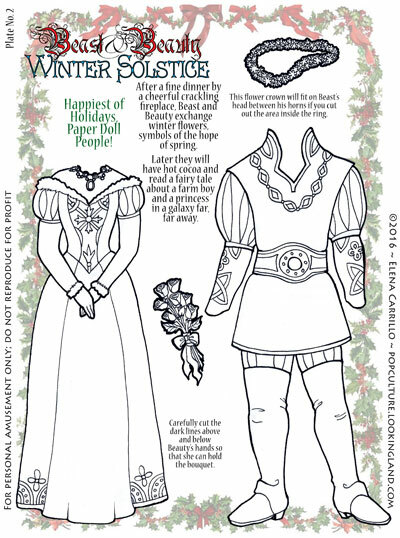 It’s pretty atypical for me to be drawn into a series like this, let alone inspired to make paper dolls for it. At least that’s a testament to how entertaining Empire is both visually as well as story-wise. Unfortunately some bad planning and other issues set this project back (way back). 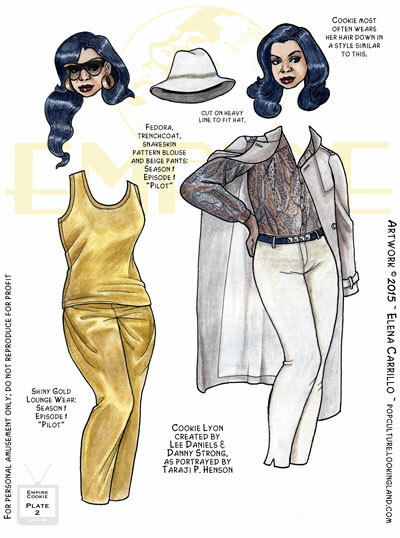 Even so, I have four plates to post of some of Cookie’s outfits from Season One. I want to share them–even as I explain the bad choices I made that led to stalling this one out.